Circling Bora Bora, the most scenic of the Society Islands in French Polynesia, on a speedboat gave us a good overview of the volcanic landscape. 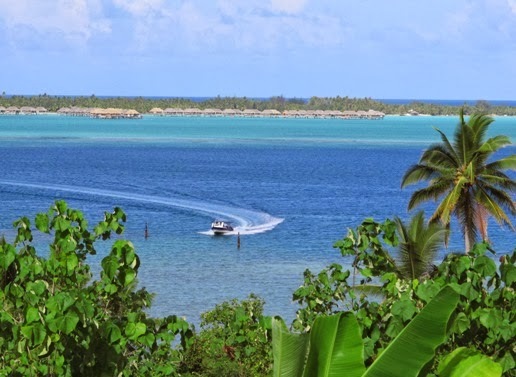 And after checking out the lagoon’s beautiful coral and fish through our snorkels, we decided to explore this tropical island by land—on a covered open air truck. “Le Trucks,” as these vehicles are called, are a main means of transportation for locals, but those have no set schedules. Fortunately, our 3.5 hour tour did have a set itinerary that would get us back to the ship before happy hour. Starting from Vaitape, the most populous town on the island (the population of Bora Bora is only about 8,000 people), we headed through the district of Fa’anui, stopping at the church there for pictures. We stopped again at Fa’anui Bay, a great spot for photos of the two prominent mountains--Otemanu and Pahia. The truck continued on to the ancient ceremonial site of Fa’anui Marae, designated by an ancient carved boulder—and then on to see bunkers constructed by American GIs during World War II. Having noticed so many colorful pareos, the sarong-like cloths worn by locals, hanging in shops, we appreciated the opportunity to observe how these are created at Mama Ruta’s outdoor shop. We watched a local craftsperson create a unique design on cotton cloth she had wet in water then folded and twisted. 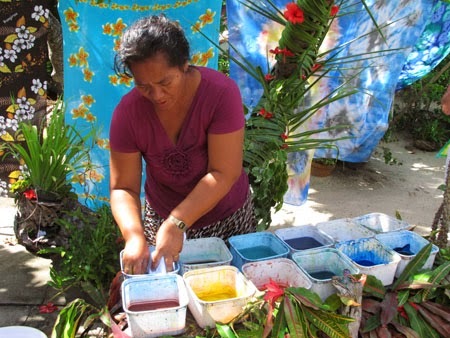 She dipped the wet fabric into several separate paint pots, each containing a different color. The art of creating a beautiful design comes in how the material is folded and dipped, a process that must be done quickly before the fabric dries. When the design is completed, the pareo is spread out to dry in the sun. Many of the pareos have the name of the island, Bora Bora spelled out. This is achieved by placing stencils on the fabric and allowing the sun to bleach out the words or to create new designs. The lightweight fabric is a local wardrobe mainstay because it can be twisted and crossed hundreds of ways into many garments. Our guide demonstrated how to make a skirt, dress, or jacket—worn by men as well as women. 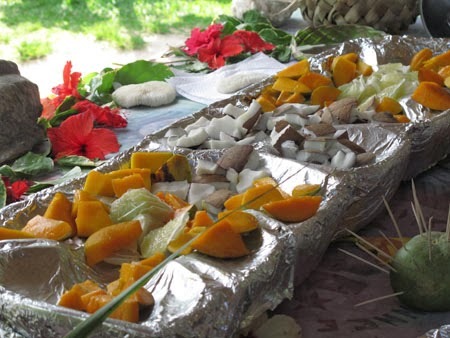 Then we sampled local fruits such as breadfruit, banana, coconut, grapefruit, and passion fruit, and I purchased a hand-painted pareo--wearable art--to take home. Flowers, mostly hibiscus, hung by each seat of the truck. Nice touch, I thought, not knowing that there was a purpose beyond decoration. 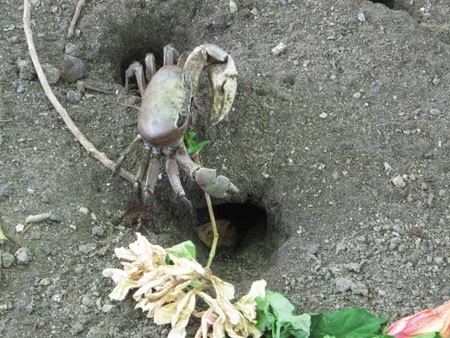 At a sandy area, dozens of holes—homes for sand crabs—made walking around tricky. Told to throw the flowers on the ground, we did and watched in amazement as the voracious critters scurried out of their holes, grabbed the flowers (which were much bigger than they were), and dragged these prizes back into their holes. 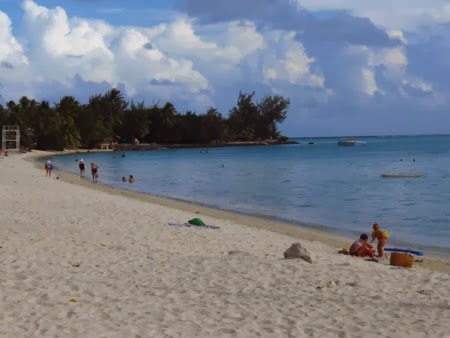 Bora Bora has beautiful white sand beaches. After going up the island’s only driveable hill, we stopped at a lookout point to take in splendid vistas. At Matira Beach, Bora Bora's most popular public beach, locals and visitors enjoyed swimming and snorkeling in the protected lagoon. Our final stop was Bloody Mary’s, a famous restaurant and bar visited by dozens of celebrities and sports stars, whose names are painted on signs out front. Inside, the floor is simply sand, so guests check their shoes and claim them again when leaving. 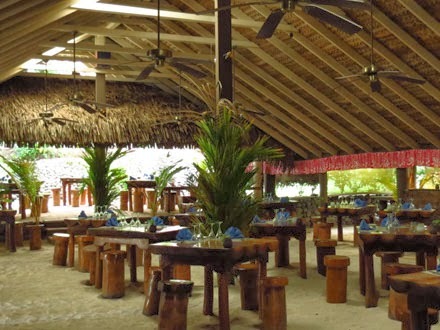 The restaurant features a large open dining area and log seats at the bar. This well-known watering hole epitomizes South Pacific ambience, and it’s the perfect spot to savor at least one island drink.